Carlisle United manager John Ward is "delighted" to have secured the signing of defender Richard Keogh. The former Republic of Ireland Under-21 captain, 22, has moved to Brunton Park on a two-year deal from Bristol City for an undisclosed fee. "I think Richard will prove to be an excellent signing for the club," Ward told BBC Radio Cumbria. "He knows the club and the players from his loan spell here last season so there won't be a bedding-in period." Keogh began his career as a trainee with Stoke City before spending a season in Iceland with Vikingur Reykjavik. He made the move to Ashton Gate in the summer of 2005. He was a regular in City's 2006/07 promotion-winning side when he picked up the club's Young Player of the Year award. He became captain of the Republic of Ireland's Under-21 side in October 2006 but found himself out-of-favour at Ashton Gate after turning down a new contract offer last year. 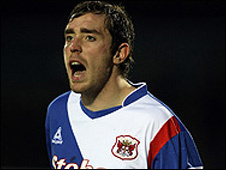 He spent the 2007/08 season out on loan - at Huddersfield Town, Carlisle and Cheltenham Town. "I'm relieved to have things sorted out now," he said. "It's been a long summer for myself with regard to my future. I had quite a few options but in my heart-of-hearts I always wanted to come back to Carlisle. "This was the best move for me and I can't wait to get going again." Keogh, who played seven games on loan at Brunton Park last season, was a long-term target for John Ward who had a bid for the player turned down in January. "I'm looking forward to playing for the manager and this football club," Keogh said. "The club can be very proud of what they achieved last season. They came close to promotion so who's to say this can't be our year?"